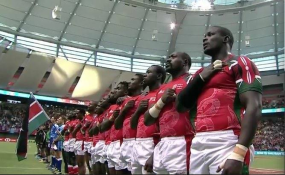 Nairobi — Tourism Cabinet Secretary Najib Balala says Kenya Sevens players will be paid directly what they are owed in dues from the now cancelled Brand Kenya 'Make it Kenya' shirt sponsorship. The CS announced that he had instructed Brand Kenya to cancel the Sh20mn contract and added he will instruct the Board's Chief Executive Officer to pay the players directly the entire Sh2.5mn they are owed. "I was really pained to see a Kenyan covering their motherland in an international event. Brand Kenya has a contract with the Kenya Rugby Union and today we are cancelling the Sh20mn contract because they have failed to pay their players. The players should go and see the Brand Kenya CEO and we will pay them directly," a furious Balala said in Mombasa on Thursday. He added; "What made you (KRU) fail to pay the players Sh2.5mn and you were given Sh20mn what is the problem?" He went on to accuse the Union of lacking professionalism with the former Sports Cabinet Secretary adding that mismanagement has been the major reason that sports in the country has not developed. "We have some rogue organizers and in these organizations we allow people to go and take leadership and then it's just about themselves. If these organizations are going to want support they must respect what we are doing to deliver that support," he added. "You can't promise to give us publicity and then in an international event we lose that publicity. No way, not under my docket. They can do it in other dockets not mine. KRU we are disappointed. We thought you guys are professionals but we are disappointed," the ministry boss added. Kenya Sevens players taped off the 'Make it Kenya' logo from the front of their jerseys during the Paris leg of the World Sevens Series in protest to lack of payment by the Union. This was barely a fortnight after the eight-month contract was signed, one that would see the players don the jerseys during the World Series and next month's Rugby 7s World Cup in San Francisco, United States. The KRU released a statement just after the uproar saying they were working with Brand Kenya for an amicable solution. This is after Brand Kenya released a statement saying they had met their end of the bargain by remitting cash to the Union. Balala while announcing that the contract will be cancelled did not spare the players of his anger, saying they had embarrassed the country. "It is very embarrassing what they have done and I am not happy about it. Even if you have problems with your organization... it wasn't written Brookside, Safaricom or Tusker; that name there was your country, your motherland which made you what you are and then you go there to embarrass us and cover it. This is not acceptable at all. We have to have some respect for the country," Balala said. The team is scheduled to resume training after the mandatory 10-day rest and recovery period to switch their attention to the World Cup. With the sponsors pulling out and an apparent cross feathers with the government and no headline sponsor, the Union now faces a hard task to prepare and take the team to San Francisco for the World Cup. The only sponsor who has remained on their jersey now is Bidco who took the back of the shirt.